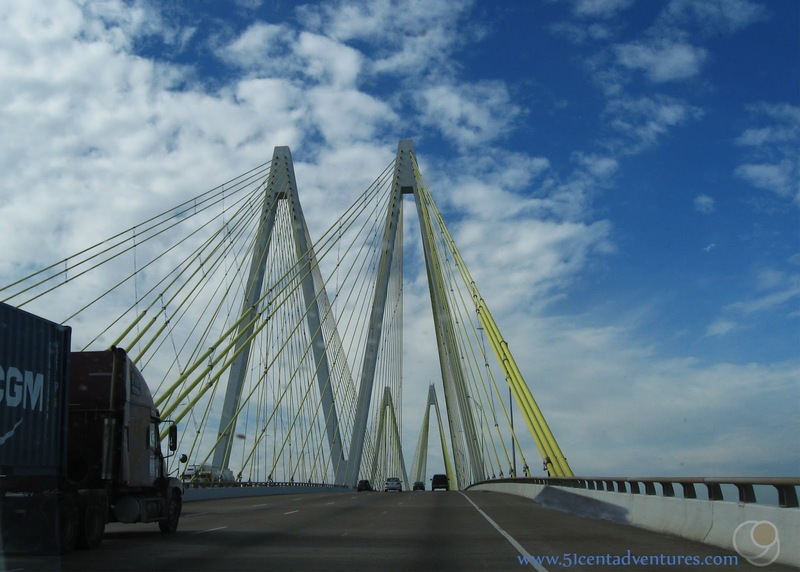 Description: This double suspension bridge spans the Houston Shipping Channel to connect Highway 146 between La Porte and Baytown. 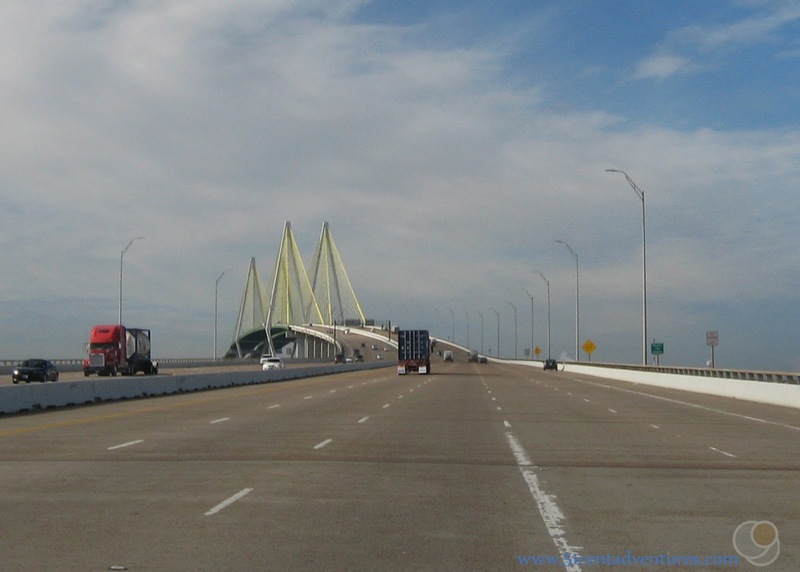 The diamond shaped towers rise to a height of 440 feet, and support the six lanes of traffic 178 feet above the water. This was the first stop of the seventh day of the Texas Coastline Road Trip that my husband and I took our kids on in November of 2014. 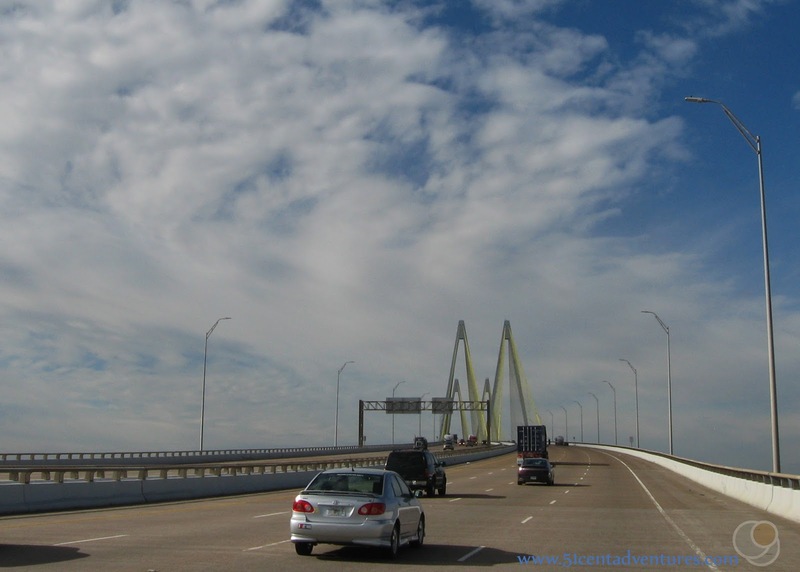 After driving around Fort Travis Seashore Park and the Bolivar Peninsula we had turned north and traveled to out stop for the night in Baytown Texas. We spent the night in a motel which was akin to heaven after five nights of camping. In the morning we stopped at a grocery store and had doughnuts for breakfast. Now we were on our way to the outskirts of Houston to visit the Battleship Texas and the San Jacinto Monument. Those of you who have been reading this blog for a while know that my husband and I are intrigued by bridges. As I was researching things to do in the Houston area a little paragraph about the Baytown bridge caught my eye. It mentioned that the bridge was a suspension bridge. I'd never driven across a suspension bridge before so I wanted to make sure that we included driving on this bridge on our route. As we got closer to the bridge I was impressed by how large it was. One thing I'd never realized before this trip was how tall bridges have to be when they are going over shipping lanes. Not only does this bridge have to carry cars across the water, but it has to allow large shipping vessels to pass under it. So even before we reached the main part of the bridge the road started sloping to get us higher over the water. Soon we were almost to the top. The 440 foot tall towers were looming before us. As we crossed over the bridge we were 178 feet above the water. This bridge was completed in 1995. Prior to that any cars that wanted to cross this section of the channel did so through a tunnel that went under the channel. However, that option was discontinued when the channel had to be made deeper to accommodate larger vessels. 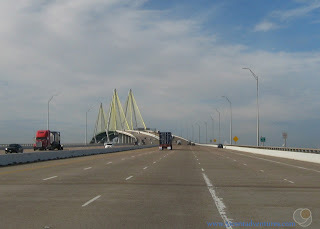 Earlier in our trip we'd traveled on the Corpus Christi Harbor Bridge. Our children had thought it was so fun to scream like they were on a roller coaster as we went up and over the bridge. They remembered that as they went over this bridge. Even our one year old joined in with the excited screaming. Going across the bridge was a simple thing, but I have great memories of it. I'm glad we made sure to put it on our list of things to see. 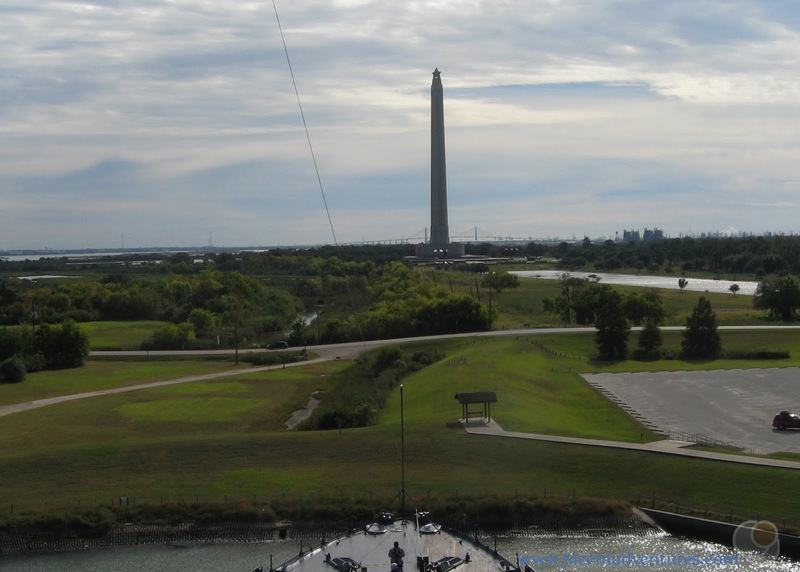 We continued on to our destination which was the Battleship Texas. While we were touring the ship we could just barely see the Fred Hartman bridge on the horizon behind the San Jacinto Monument. 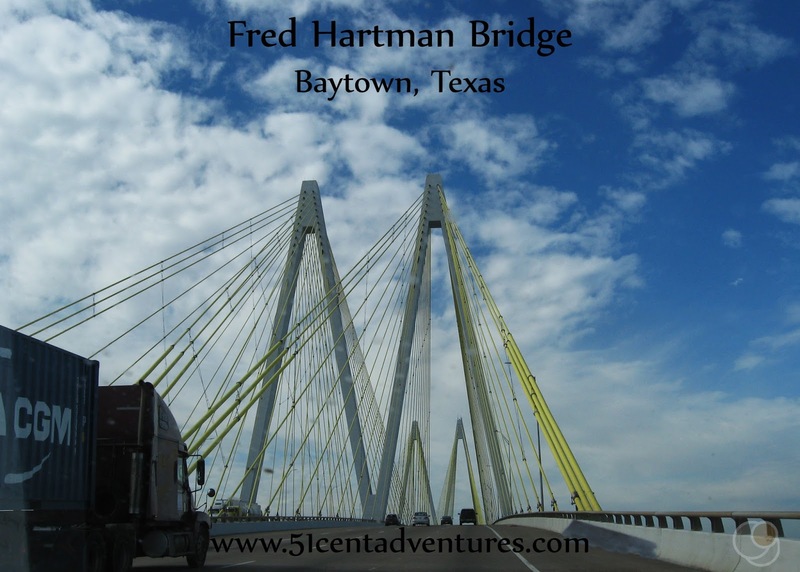 Recommendation: If you'll be in Houston, Texas, and you love unique bridges, then you should definitely go out of your way to drive on the Fred Hartman Bridge between Baytown and La Porte Texas. Directions: Originally I assumed that this bridge spanned the I-10. However when I looked it up I discoverer that it spanned Highway 146 over the Houston Shipping Channel. 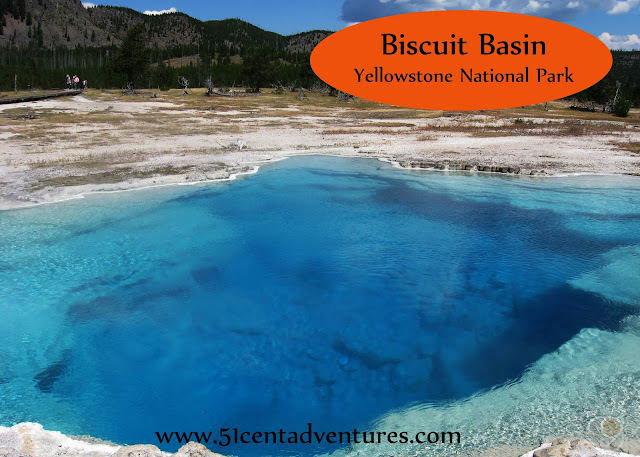 Places Nearby: If we'd been in the mood to visit yet another beach we could have gone to Sylvan Beach Park which is less than 10 miles south of the bridge. It is a little beach on Galveston Bay. The park has a fishing pier, sandy beaches, a playground, a skate park, a boat ramp, and plenty of picnic tables. If I remember right, we did have this place tentatively scheduled as a stop for lunch, but we ended up skipping it because the kids were too tired.